The maxi dress is the perfect choice when I want to feel comfortable but still be stylish (seen recently here). I love how I can slip it on and instantly feel put together--and it only requires one piece. I bought this seafoam number two years ago for a wedding and fell in love with it. It's more formal than most of my maxi dresses but that's what makes it fun for day wear. I mixed it with my Kooba handbag for some flair but added gold sandals and a cargo jacket to give it a more casual feel. Taylor, I'm OBSESSED with that dress. Such a gorgeous color and I love the shape. i also love that with a maxi dress, it feels so put-together for being only one piece, and you can accessorize all you want with shoes, jewelry and bag! love this look! the color is hot for spring. i love the idea of wearing a more formal dress during the day, i think that's what was not working with one my recent maxi dresses, it looked too boho, i need to posh it up! Woow, i loooove that dresss! Such a stunning look. The green maxi looks so perfect on you. That works VERY well! I love that color on you! i wore that seafoam number in a wedding! i forgot i had it - great to know i can re-wear that baby ! wow! I love how you put the b/w bag withe the hot green dress together. An unexpected but succesful choice. You pull off maxi dresses so well. That color is extraordinary on you, Taylor! That dress looks beautiful!! The color is amazing! love the seafoam colour against your skin tone! Lovely color on you! Maxi dresses, especially ones out of jersey, make me feel like I'm in my pj's, except it's socially acceptable to wear out=the perfect win-win situation! you look fab in that bright color, and i am TOTALLY coveting your snakeskin bag. i have a snakeskin pair of shoes that i wore on TCC yesterday, but i can't get enough of it! I love this maxi! The color looks great on your skintone. That purse is also to die for! Green has become my favorite colour lately it's such a refreshing bright and a bit different from the standard, blue, pink, red. It's a beautiful dress! I love the detail in the top part of it! amazing! i LOVE that color! and it looks great on you! LOVE that dress. The cut + color is amazing! I wore a similar outfit on my blog last week here: http://bit.ly/muIQqh! Maxi dress, cargo jacket. Love it! Maxi dress are really so comfortable and stlish. ı also like maxi skirts. color of dress is fab! girl u look great in that dress!! I love maxi dresses for spring and summer! They make an effortless outfit look more put together! Your wearing one of my new fav colors ~ Kelly Green! You look great girl... as always! That green is gorgeous!! Beautiful. They really chose the perfect green. It goes to well with pink lips. It looks great on you! So perfect! I love how easy this outfit is yet is completely model worthy. Love love love! This dress is so incredibly flattering on you -- from the color to the silhouette! cool blog! i just came across it! i really like all your photos especially your outfits! the green color looks amazing on you!! come visit my blog and maybe we can follow eachother! I LOVE that bag -- it's basically exactly what I need this summer! Gorgeous dress and the color is amazing! Love the colour dress son you. Oh I want that maxi dress! I've been dying trying to find the proper one! I love the color combination here! That dress is such a beautiful color of green, I have a shorter version from Target. Cute! The dress is awesome! i've been trying to work up the confidence to rock a maxi and this is so inspiring. also, your nail color. the blue is kiler! great look for you taylor! This dress is so fabulous! That dress is beautiful on you. I love your nail color too! Great pics! Awwwwwwwwww I love this dress! Taylor!!!! This is the best dress ever created and it looks like it was made just for you! 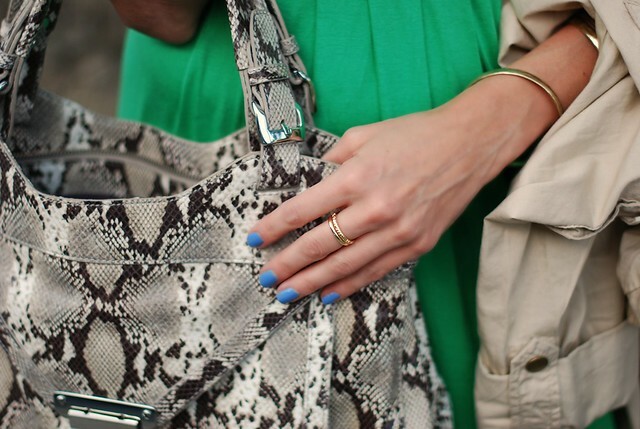 LOVE the snakeskin bag with the kelly green and your nails are so perfect. It's like mini-color blocking! Enter my Nanny Styles Contest! absolutely love the structure of this dress. the color is amazinggggg!! Love the dress... I want one! green is a gorgeous color on you. and i love it paired with the trench. Such a pretty color...you always wear the best colors!! this made me giggle because i posted a pic of my sea foam green pants and someone corrected me! saying it's "hospital" green and that seafoam is much lighter. i say SEA FOAM! ugh, i love this color. and it looks great on you! What a fantastic look again, the dress is beautiful! That dress is georgeous ! @jennie-- people are so strange sometimes. Hospital green! Even if it was who cares! Thanks for the love! !